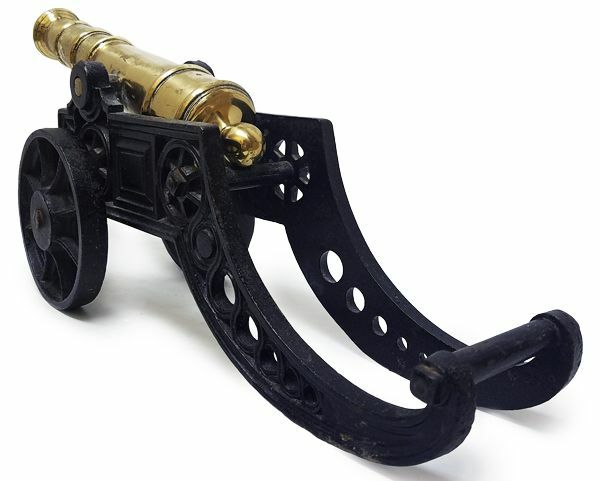 To view our current inventory of antique signal, salute and ship's cannons, click here! 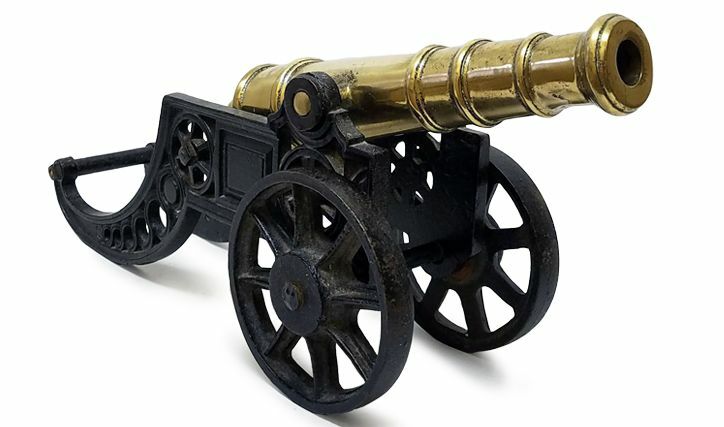 Signal cannons were used aboard ship and ashore to make salutes, to warn of danger, and to attract attention in the case of an emergency. They were also used to start yacht races. These cannons were generally cast in the style of the period to which they belong. 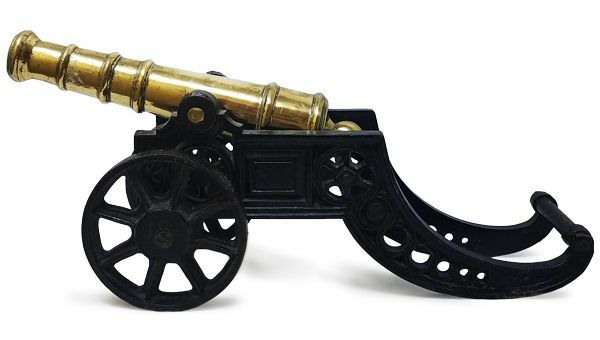 Presented is a Mid 19th Century signal cannon with a bronze barrel and cast iron carriage. It likely was made in England under the reign of Queen Victoria. 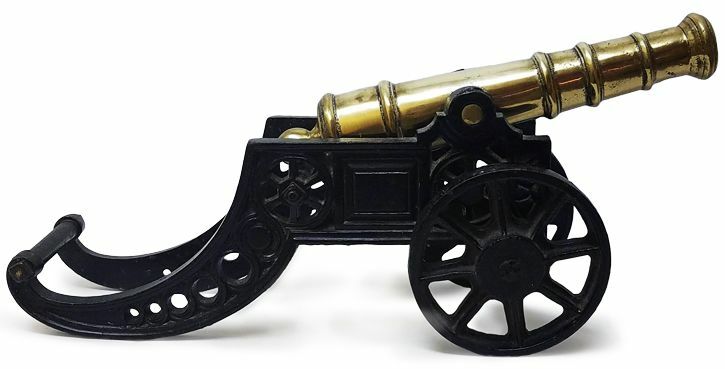 Although is it missing on this carriage, we have had a one of these cannons in the past with a cap with a royal crown on the left side of the carriage covering a nut, which supports our conclusion of its date. 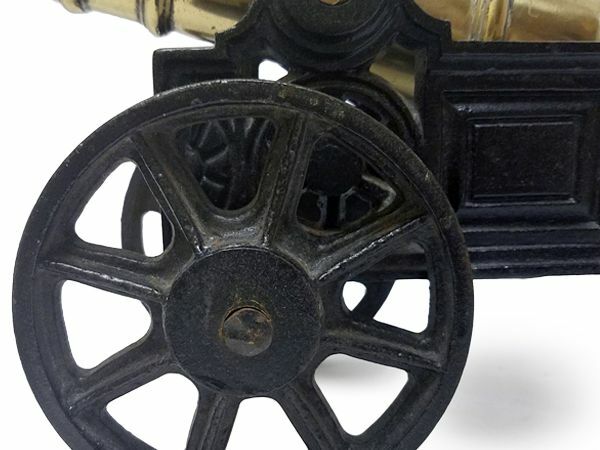 Its proportions are typical of a British field gun, and it is fitted to its original cast iron carriage. Note the touch hole which has been filled with some kind of temporary material and can be drilled out for firing. It is being sold for display purposes only, and no attempt should be made to fire it without it first being inspected by a gunsmith. "Metal screws and nuts appeared in the 15th century. The square or hexagonal head or nut was turned with an appropriate box wrench; a T-handled socket wrench was developed in the 16th century. Some screws used in 16th-century armour have slots (nicks) in which a screwdriver may have been used, although this tool is not shown. Deep notches on the circumferences of the heads of other armour screws suggest that some type of pronged device was used to turn them. Slotted, roundheaded screws were used in the 16th century, but few screw-and-nut-fastened clocks are in evidence earlier than the 17th century. 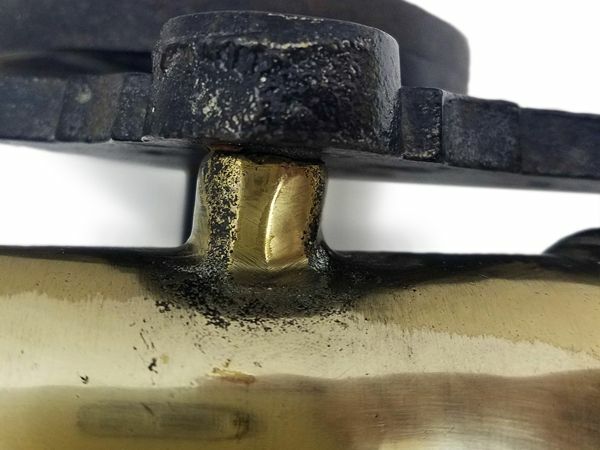 Metal screws were called machine or machinery screws since they were made of metal and mated with threaded holes." We are conservatively estimating its age as at least 150 years, but it could be earlier. 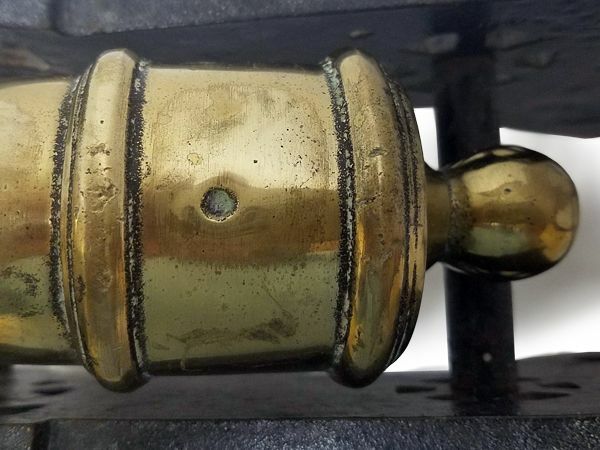 CONDITION: It is possible that the cannon was painted back originally, but the paint has been removed and some effort was made to bring the barrel to a high polish. However, the finish is not uniform and some parts of the barrel have a brighter shine than others. The barrel shows some casting imperfections and marks associated with age and use, but appears sound. Because of its age, it should not be fired without a gunsmith's inspection. The trunnions are cast as part of the barrel which is tight in the trunions which is customary and the trunnion caps are part of the carriage. There are no mold marks or inscriptions. Bronze Cannon 18" Length overall Length of carriage 15"
Length barrel 11 1/2" Bore 3/4"
Width of barrel at bore 1 5/8" Width at last reinforcing band 2 1/2"
OUR UNCONDITIONAL NO NONSENSE GUARANTEE: If not completely satisfied with your purchase it may be returned within five days of receipt in its original packaging if without damage. Return items must be insured for their full value. Only a prior email authorization from us for the return is required. Shipping charges are included in this offer within the continental United States if an error is due to our fault.. ACCEPTED FORMS OF PAYMENT are Bank wire transfer, cashier's check, or personal check in which case the item will be held until cleared. Prices are quoted net to us, and the use of credit cards or PayPal may include an additional charge. Copyright 2019 by Land And Sea Collection™. All Rights Reserved.